The world pulses slowly with the beating heart of a slow, lonely death. Paris burns with bodies rotting in the streets. Civil war and mass genocide are on the lips of everyone with a breath left in their lungs. Vampires and werewolves walk amongst us. They don’t shimmer in the sun, they don’t walk around shirtless. They hide in the shadows, begging for the end to come. The police, church, and military are on the hunt to destroy them, science has created and spread a vaccine that turns human’s blood into poison for the hunted, and a mass exodus to third world countries has begun. This is the world we’ll find a few years from now according to Axel Taiari. 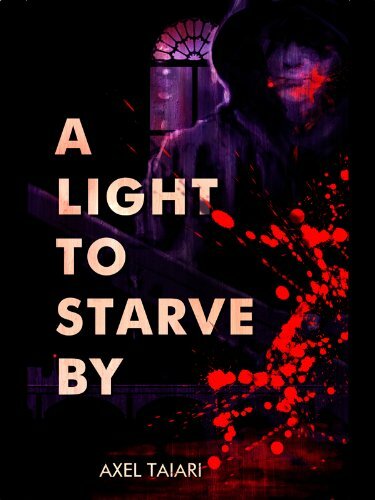 With so much despair and hopelessness, chivalry is still able to elbow its way into position in Taiari’s A Light to Starve By, originally printed in Eternal Night: A Vampire Anthology, and is now for sale for the low low low price of ninety-nine cents at Amazon.com as a part of their budding Kindle Singles program. As the final embers of humanity hiss out, when eyes turn skyward, and the tears of so many turn the ashes into paste, the power of love moves us all; whether we’re bumping around in the dark, or hunting down the monsters within. Love prevails and leaves you bleeding on the floor in this dark, noir Romeo and Juliet story. However, this time around Romeo drinks blood, Tybalt is the catholic church, armed to the teeth with silver bullets and are severing heads without discrimination. Benvolio is a one-eyed blood dealer, scarred from when his wife lost her mind and tried to kill him. For less than a dollar, you can have it all! P.S. Dakota Fanning hasn’t done anything decent since or before Man on Fire.